Apple's 10.5-inch iPad Air is the new middle-tier iPad at $499. Subscribe for regular MacRumors news and future iPad Air info. 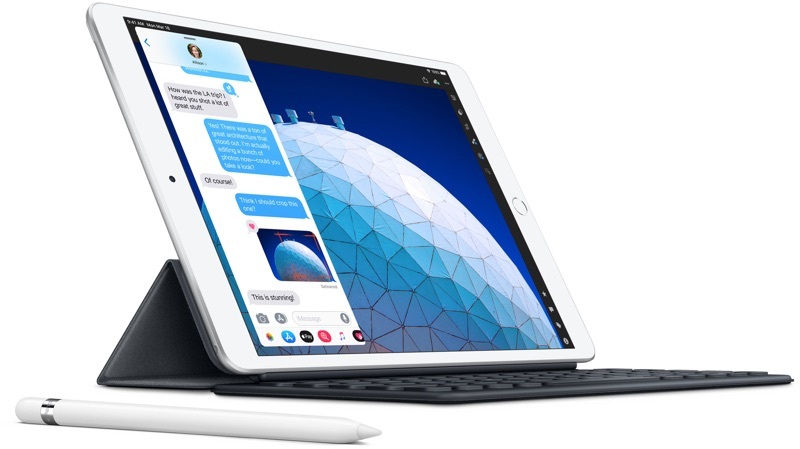 Apple in March 2019 resurrected its long dead iPad Air line with the introduction of a brand new $499 10.5-inch iPad Air that serves as a middle-tier iPad option between the lower-end $329 9.7-inch iPad and the higher-end $799 11-inch iPad Pro. 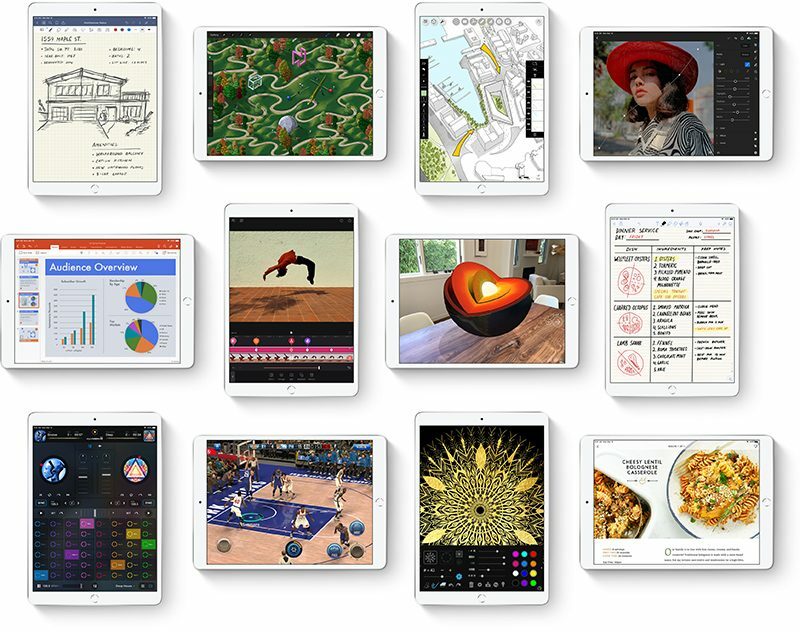 The tagline for the new iPad Air is "power isn't just for the pros," which is fitting because while the iPad Air shares some features with the iPad Pro models, it doesn't have all of the pro-oriented bells and whistles. Apple's iPad Air features the same thin and light enclosure that was used for the now-discontinued 10.5-inch iPad Pro, which it replaces. At just 6.1mm thick and with a weight of a pound, it's portable and lightweight. It is available in Gold, Silver, and Space Gray with either 64 or 256GB of storage. 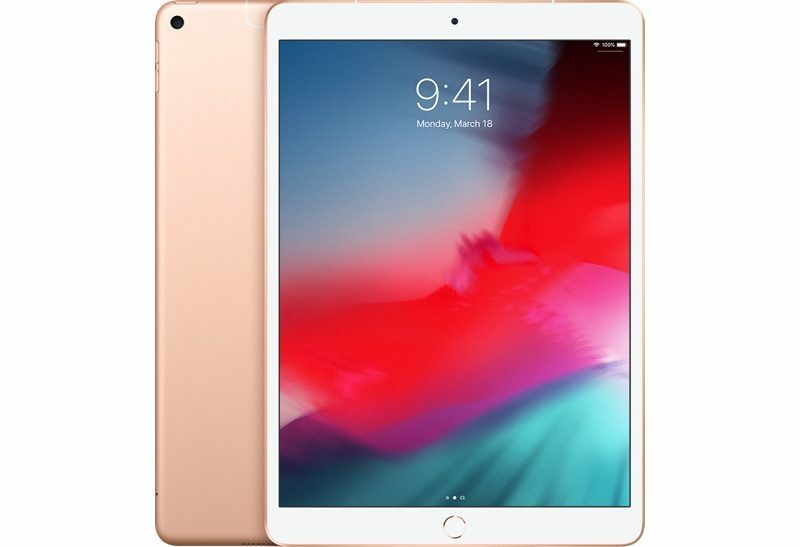 Unlike the iPad Pro, the iPad Air does not adopt the thin wraparound bezels, the squarer enclosure, or the front-facing Face ID camera, instead continuing to use a tapered body design with thick bezels at the top and bottom to support the Touch ID Home button that it continues to offer. Like older iPad models, it still has a headphone jack, a feature eliminated in the iPad Pro. The iPad Air includes the same laminated display technology that was in the 10.5-inch iPad Pro, offering a 2224 x 1668 Retina display with TrueTone for adjusting the white balance of the display to match the lighting in the room and wide color for vivid, true-to life colors. Support for the first-generation Apple Pencil is included, and there's a Smart Connector on the side of the iPad Air that works with Apple's Smart Keyboard. At the bottom of the iPad Air, there's a Lightning port for charging purposes as only the iPad Pro models have adopted USB-C. Inside the iPad Air, there's an A12 Bionic chip with Neural Engine and M12 coprocessor, the same hardware used in the most recent iPhone models. It offers the same all-day battery life as other iPads, lasting up to 9 to 10 hours depending on task. Rear camera technology is one area where Apple aimed to keep costs of the new iPad Air lower, so it uses an 8-megapixel f/2.4 rear camera rather than the newer 12-megapixel f/1.8 camera tech in the iPad Pro. It's the same camera that's used in the lower-cost iPad and the iPad mini 5 and it maxes out at 1080p video recording. At the front, there's a 7-megapixel FaceTime HD camera which is the same camera that was in the previous-generation iPad Pro. It supports Retina Flash, Live Photos, and 1080p video recording, but lacks Smart HDR and features that come with the TrueDepth camera such as Portrait Mode and Memoji. There are two speakers instead of four like in the iPad Pro, and it uses Bluetooth 5.0 technology, WiFi 802.11ac, Gigabit-class LTE on cellular models, eSIM technology, and dual microphones. Pricing on the new iPad Air starts at $499 for the 64GB WiFi-only model, with the 256GB model priced at $649. Cellular models are available for $130 more over the base price for each configuration. The Smart Keyboard for the iPad Air is priced at $159, while the first-generation Apple Pencil costs $99. Apple used to have an iPad Air 2 back in 2014, but it was discontinued in favor of the iPad and iPad Pro lines. 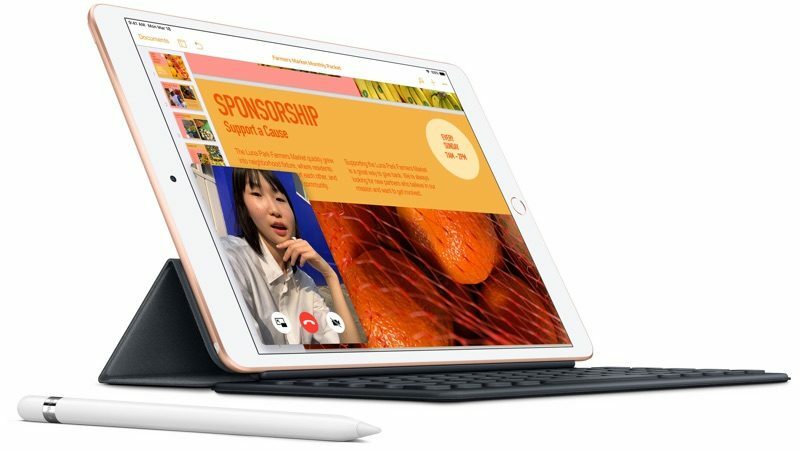 In 2019, Apple brought back the iPad Air with the aim of introducing a mid-tier tablet to take the place of the 2017 10.5-inch iPad Pro, which was still for sale up until when the iPad Air was released. The iPad Air replaces the older iPad Pro, so Apple has recycled the 10.5-inch iPad Pro's body and reused it for the iPad Air. The iPad Air is identical in size and thickness to the 10.5-inch iPad Pro, and just a bit lighter weight. It features the same slim, tapered sides and wide top and bottom bezels, used to house the front-facing camera and the Touch ID Home button. An older design with Touch ID and thicker bezels differentiates the new iPad Air line from the 2018 iPad Pro models as those have edge-to-edge displays with slimmer bezels and no Home button. Rather than adopting USB-C like the iPad Pro, the iPad Air features a Lightning port at the bottom for charging purposes. At the top, there's a 3.5mm headphone jack, a feature no longer present on modern iPad Pro models. Dual speakers are available at the bottom of the tablet, and at the back, there's a single-lens rear camera with no flash. A standard sleep/wake button is located at the top of the tablet, and there's a volume up/down button on the side. 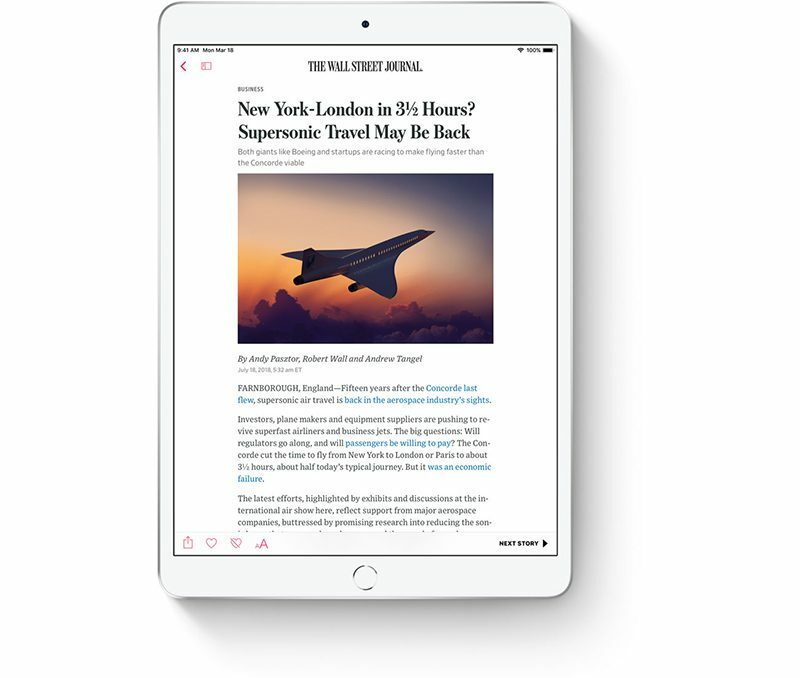 Available in Silver, Space Gray, and Gold, the iPad Air measures in at 250.6mm (9.8 inches) tall, 174.1mm (6.8 inches) wide, and just 6.1mm (0.24 inches) wide. It's thin, light, and has a larger display than the lower-cost iPad, though it's not quite as large as the 11 and 12.9-inch iPad Pro models. It weighs just a pound, making it a bit lighter than the 10.5-inch iPad Pro it's modeled after. Rather than adopting Face ID, the 10.5-inch iPad Air, much like the 9.7-inch iPad, features a Touch ID Home button for biometric authentication purposes. People who prefer Touch ID over Face ID will want to consider the 10.5-inch iPad Air over the recent iPad Pro models for this reason. 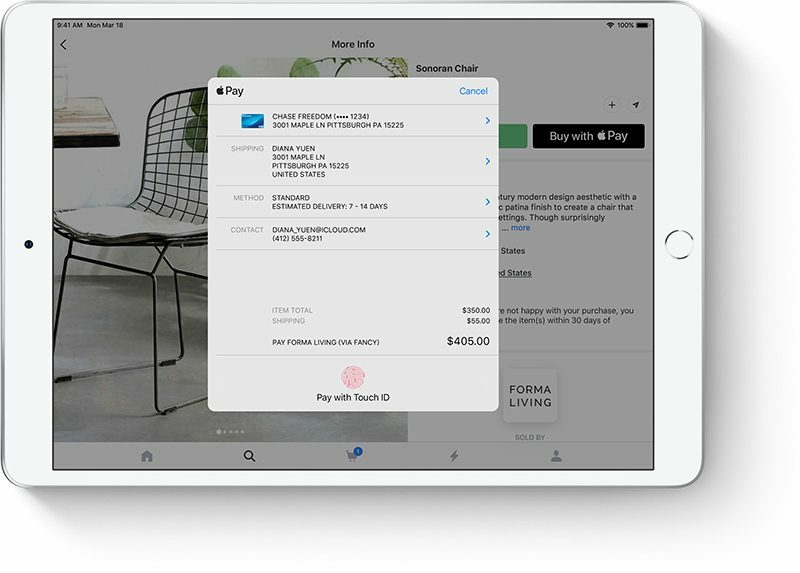 Touch ID is used to unlock the iPad, access apps, and make purchases with Apple Pay. 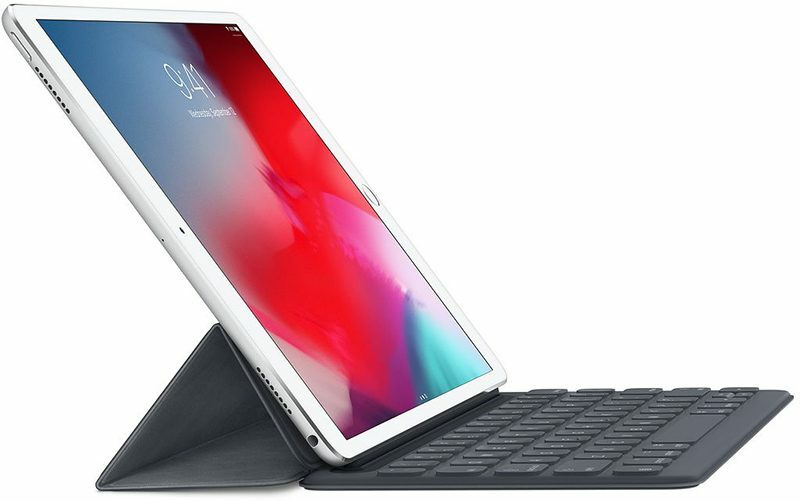 On the left side of the iPad Air, there's a Smart Connector that's designed to work with the new Smart Keyboard that Apple has released for the iPad Air. The iPad Air features the same multi-touch fully laminated display as the 10.5-inch iPad Pro with a 2224 x 1668 resolution at 264 pixels per inch, though it does not feature ProMotion technology, a feature limited to the Pro line. 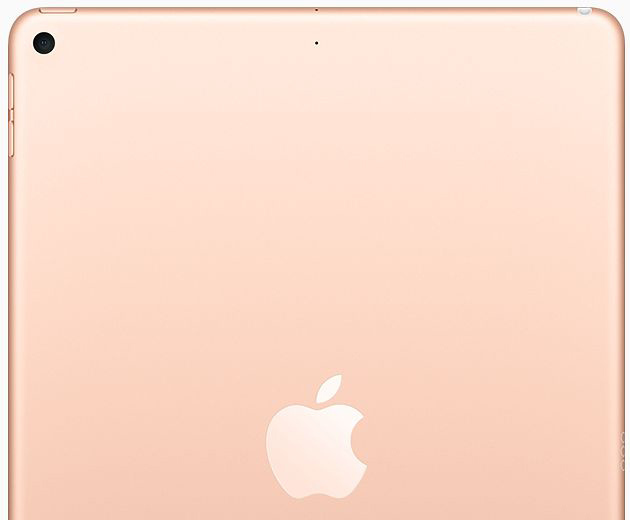 The iPad Air does offer 500 nits brightness and 1.8 percent reflectivity thanks to an antireflective coating. To protect it from fingerprints, there's the same fingerprint-resistant oleophobic coating that's on all iPads. 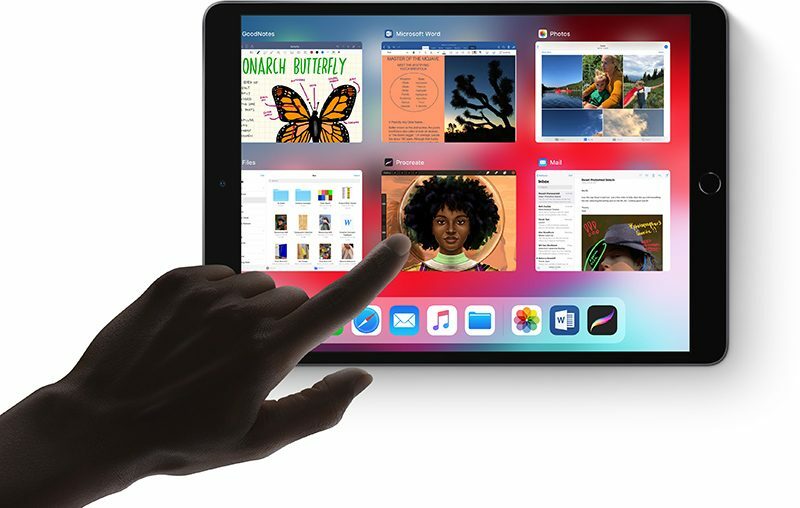 A laminated display, used in all iPads with the exception of the 9.7-inch model, combines the coverglass, touch sensor, and LCD into a single layer that reduces thickness and brings the LCD layer closer to a user's eyes for a more immersive experience. P3 wide color gamut support is included for rich, vivid colors that are true to life and accurate, which is ideal for artists, and there's True Tone support. True Tone adjusts the white balance of the display to match the ambient lighting to make the screen easier on the eyes. If you're in a room with yellower lighting, for example, the iPad's display will be warmer in color so there's not a stark contrast between the color of the iPad and the lighting in the room. Apple included Apple Pencil support in the iPad Air, which means the entire available iPad lineup now works with the Apple Pencil. The iPad Air is compatible with the first-generation Apple Pencil, which is the model that has the Lightning connector on the end. It does not work with the second-generation Apple Pencil that was introduced for the iPad Pro models, but it is compatible with the Logitech Crayon. For the iPad Air, Apple used the same A12 Bionic chip that's also included in the 2018 iPhone lineup. It's clocked to 2.4GHz, the same as the iPhone's A12 chip, and the performance is quite similar to the performance of the iPhone XR, XS, and XS Max. 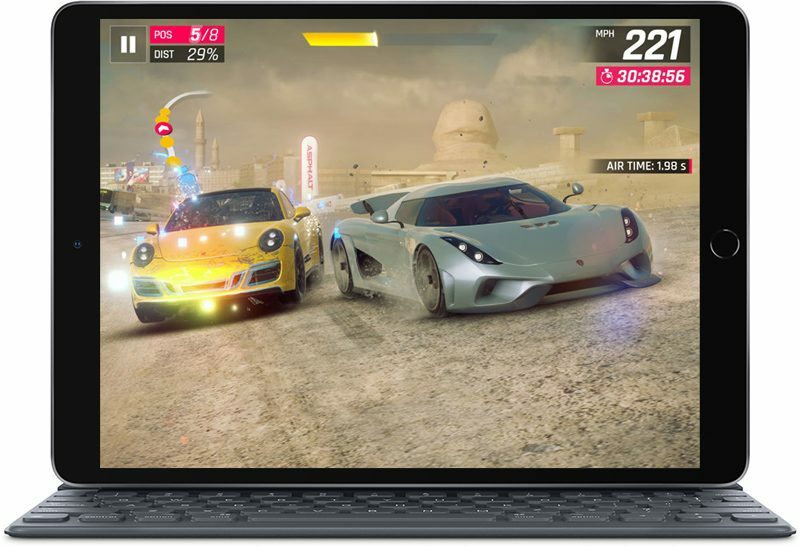 Compared to the A10X Fusion in the 9.7-inch iPad, the A12 offers a 70 percent boost in performance and twice the graphics capability thanks to the 4-core graphics engine included. The A12 Bionic chip has an 8-core Neural Engine that uses real-time machine learning to power features across iOS, improving photo taking, gaming, augmented reality, and more. Apple in 2018 opened up the Neural Engine to its Core ML platform, allowing developers to take advantage of real-time machine learning features in their apps. The A12 Bionic brings faster detection of AR surfaces for the rear camera, better AR experiences for the front-facing camera, and immersive 3D gaming experiences. The iPad Air is equipped with 3GB RAM. That's 1GB more than the 9.7-inch iPad and 1GB less than the iPad Pro models. It's also the same amount of RAM available in the iPhone XR. The iPad Air features an 8-megapixel rear facing camera with an f/2.4 aperture, which is the same camera that's available in the 9.7-inch iPad. It supports Live Photos, auto HDR, 43-megapixel panoramas, Burst mode, and Timer mode, but it is not as advanced as the upgraded 12-megapixel camera in the iPad Pro, making rear camera one of the major differentiating factors between the iPad Air and the iPad Pro. There is also no rear flash. 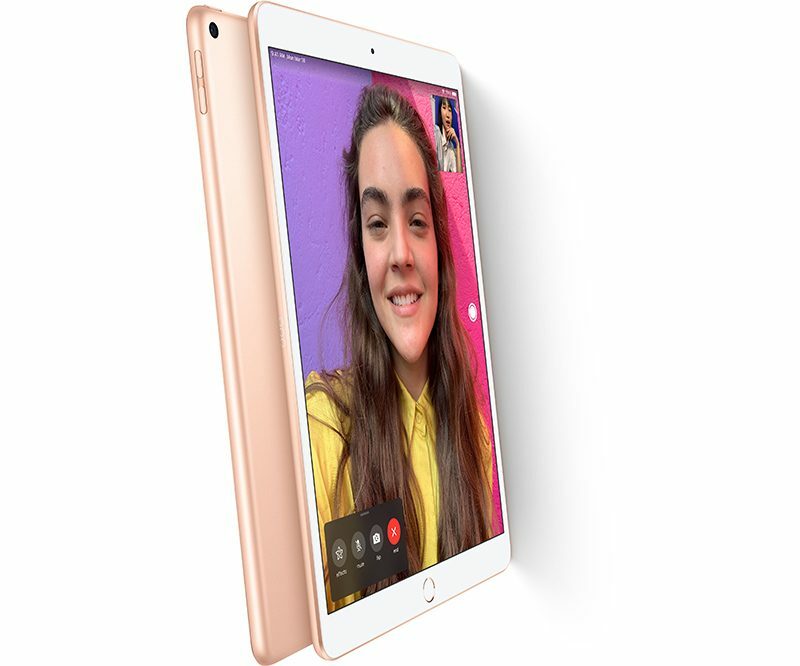 The iPad Air's camera is able to capture 1080p HD video at 30 frames per second and 720p Slo-mo video at 120 frames per second. The front-facing camera is better than the camera in the 9.7-inch iPad at 7 megapixels and an f/2.2 aperture, making it almost on par with the iPad Pro. There is no TrueDepth camera system, though, so there's no Face ID, Animoji, Memoji, or Portrait Mode. The front-facing camera is more advanced than the rear camera in some ways, supporting wide color capture and Retina flash. The iPad Air features what Apple calls "all-day battery" which means it lasts for up to 10 hours depending on task. That's the same battery life available across the iPad lineup. As mentioned above, the iPad Air charges through a Lightning port at the bottom of the tablet that works with a Lighting to USB cable and included 12W USB Power Adapter. The iPad Air is available with either 64GB of storage ($499) or 256GB of storage ($649). There are two speakers located at the bottom of the iPad Air for stereo sound (vs. the quad speakers in the iPad Pro) along with dual microphones for FaceTime calls. The iPad Air supports 802.11ac WiFi with speeds up to 866Mb/s, Bluetooth 5.0, and Gigabit LTE. It supports 28 LTE bands, including band 1, 2, 3, 4, 5, 7, 8, 11, 12, 13, 14, 17, 18, 19, 20, 21, 25, 26, 29, 30, 34, 38, 39, 40, 41, 46, 66, and 71. There are two SIM options in the iPad Air: a physical nano-SIM slot at the side of the device and an eSIM, or digital SIM, which is designed to work without the need for a physical SIM card. Apple first introduced the Apple Pencil alongside the first 9.7-inch iPad Pro in 2015, and while it was once limited to the most expensive tablets, every iPad in Apple's lineup now works with an Apple Pencil. The iPad Air is compatible with the original, first-generation Apple Pencil and it does not work with the second-generation iPad. 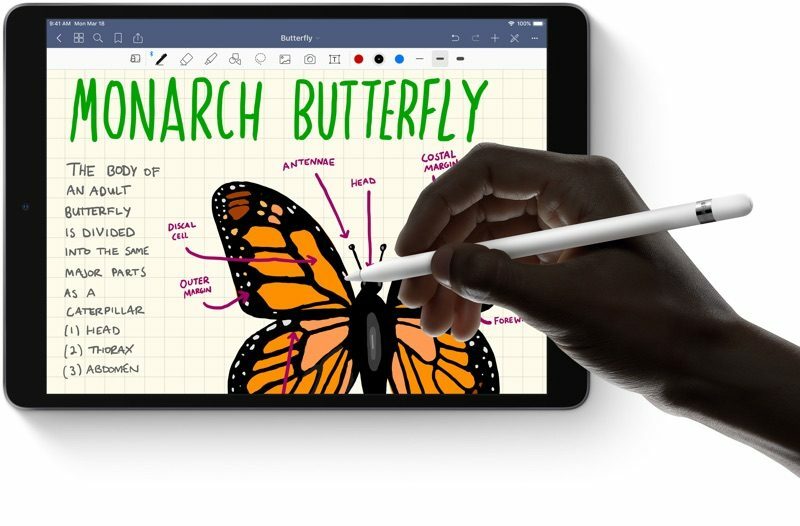 The Apple Pencil is a stylus that's designed to offer unparalleled precision and integration with the iPad while also offering a natural feel that's similar to the sensation of using a pen or pencil on paper. There are pressure and positioning sensors built into the Apple Pencil to allow it to detect a range of forces for pressure-sensitive drawing and writing. Two tilt sensors in the tip of the Apple Pencil determine the orientation and angle of the hand holding it, enabling shading techniques. The Apple Pencil offers a 12-hour battery life and it charges through the built-in Lightning connector at the bottom of the device. A 15-second charge delivers a half hour of power, so it's always going to have juice when needed. 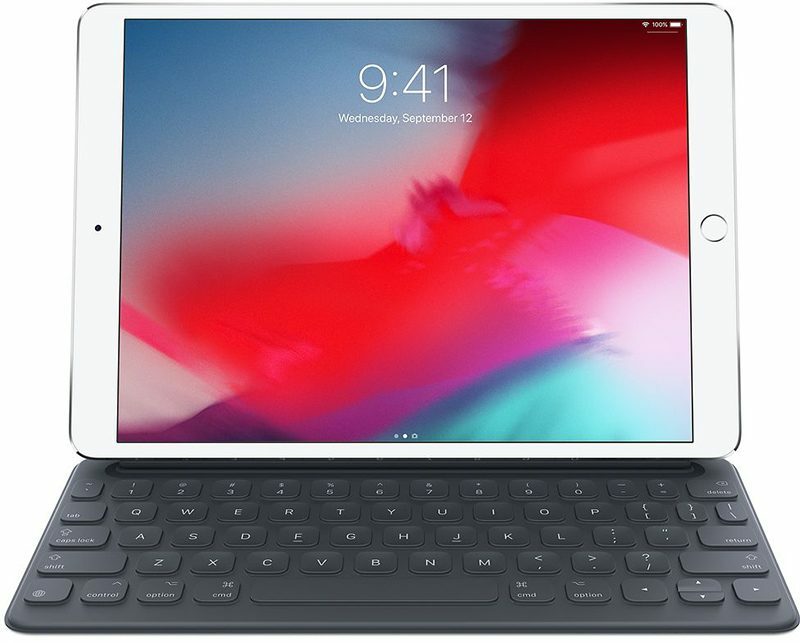 The iPad Air features an on-screen keyboard, but Apple has also designed a hardware-based solution, the Smart Keyboard, that works with the Smart Connector on the side of the device. The Smart Keyboard's keys are covered in a woven fabric that's laser ablated to the shape of each key, so they have a soft feel. The fabric on the keys provides the tension, allowing Apple to keep the keyboard thin (4mm) because there's less need for traditional hardware. There are no wires or standard keyboard components inside the Smart Keyboard. Instead, there's a thin sheet of nylon etched with metal inside the two outer layers of the accessory, which serves as the base conductive material for a two-way flow of power and data provided by the Apple Smart Connector on the iPad Air. Since it's powered by the iPad Air, there is no battery and no need to charge the Smart Keyboard. When not in use, the Smart Keyboard serves as a Smart Cover for the iPad Air, so it's always handy and easy to transport. When used as a keyboard, the Smart Keyboard has a portion that folds into a triangle like a traditional Smart Cover for the iPad to rest on. The keyboard can also fold up behind the iPad Air to let Smart Keyboard serve as a stand for watching videos. The iPad Air can be purchased from Apple's online store and Apple retail stores. The 64GB WiFi only model is priced at $499, while the 256GB model costs $649. The 64GB WiFi and Cellular model costs $629 while the 256GB WiFi and Cellular model is priced at $779. The Apple Pencil is available from Apple for $99, while the Smart Keyboard is priced at $159.